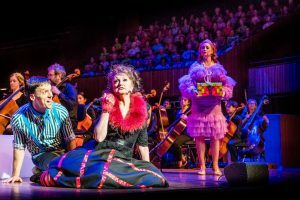 Candide review (Sydney Opera House) | Daily Review: Film, stage and music reviews, interviews and more. They’ve been rewriting this now applauded Leonard Bernstein musical ever since he created it back in the 1950s. Famed leftist playwright Lillian Hellman wrote the first text, while under the shadow of the House Un-American Activities Committee, but a long parade of writers and especially lyricists have played their bit. Actually Voltaire wrote the original Candide two centuries earlier: a satirical novel about an optimistic young man on the edge of Enlightenment adventuring across the globe and witnessing its inequities. This epic concert version with 360 singers of Sydney Philharmonia Choirs, the 90-strong Sydney Youth Orchestra and a dozen soloists is true to Bernstein’s musical vision. Yet the master was still tinkering with it right up to the first time he conducted Candide, just a year before his death. This constant reworking has surely kept sharp Voltaire’s old satirical teeth. After that unsuccessful premiere, the rejigging over the decades has delivered award-winning revivals on Broadway and the West End. Candide may be epic but it requires all the updates and topicality of good cabaret. Director Mitchell Butel works to achieve this casual intimacy with a breezy edited narration from Phillip Scott and a tongue-in-cheek presentation from his performers playing in front of the orchestra. And with a wink, Scott reminds us that Voltaire’s old critique of religious hypocrisy, sexual mischief, petty nationalisms, greed and bigotry still rings bells today. Even re-working Hugh Wheeler’s text (which replaced Hellman’s), Voltaire’s picaresque tale is still a ridiculous wandering story of mad coincidence and buffoonery. L to R: Alexander Lewis, Caroline O’Connor and Annie Aitken. Photo by Grant Leslie. Candide (Alexander Lewis) is expelled from his happy life in Westphalia after falling in love with his better, Cunegonde (Annie Aitken). He falls prey to wars, shipwrecks, earthquakes, the Inquisition, Jesuits, slave-traders and gold-diggers, and somehow keeps finding and losing the now sluttishly virginal Cunegonde and her worldly chaperone (Caroline O’Connor). Cunegonde’s campy brother in pink, Maximilian (Kanen Breen), and their coquettish maid Paquette (Katherine Allen) also keep globally re-appearing. With nimble choreographic support from Amy Campbell, these adventures are mostly performed around a few boxes in a row in front of conductor Brett Weymark and his orchestra and massed choir. From the famous overture, it is Bernstein’s sumptuous, ever surprising melodies and songs, echoing the best of 20th Century musicals and movie scores, which is the real star here. The full choir sadly is only used momentarily but, amongst his many droll touches of meta-theatre, Butel makes them players, giving them lots of united action, waving, costume changing and sound effects to support the soloists. Their full vocal power is though notable at the end when they give glorious voice to where humanity can find happiness – in Universal Good. This is Candide’s serious quest and Alexander Lewis manages to make our hero both a naïve dork and yet beautifully full voiced and sincere. Anne Aitken struts and trills delightfully as Cunegonde while Caroline O’Connor’s sassy energy and inventiveness is indispensable when the story threatens to jump the tracks. Scott too as the philosophising Pangloss does a clean line in patter song worthy of Gilbert and Sullivan. Regretfully, even with mics and such enthusiastic playing, performance detail from the soloists and, with some, the lyrics are lost in the distance of this large Concert Hall setting. Candide brings that challenge of combining grand epic and sharp cabaret, just as it must balance between philosophical quest and circus high jinks. But this ambitious telling mostly gets it right, production designer Brendan de la Hay relishing the fun with his witty exotic costuming and the soloists doing full justice to Bernstein’s stirring songs. Brett Weymark is an agile conductor, as theatrically literate as he is musically, and melds the drama and orchestration with aplomb. 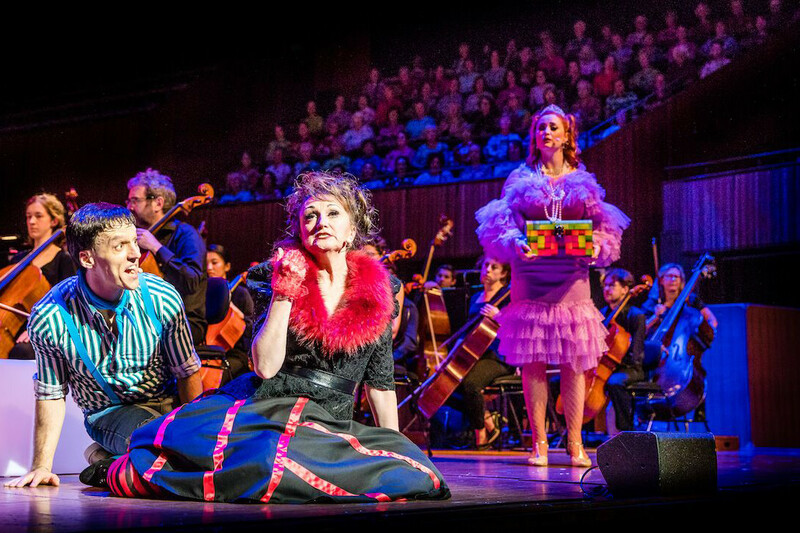 Candide was at the Sydney Opera House September 29-30. Main image of Phillip Scott (left) and Alexander Lewis (right) by Grant Leslie. 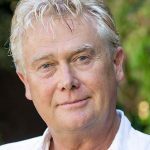 Martin Portus, a former ABC Radio National and TV broadcaster, is a writer, critic and media strategist. Great review, Martin. Amazing blend of talented professionals, aspiring young performers and mighty choral forces.